Specialized white cells concerned in the body's immune system. Several different types can be distinguished. B lymphocytes produce antibodies (IMMUNOGLOBULINS) and are divided into the plasma cells that secrete the immunoglobulins and memory cells that act when the event that stimulated antibody selection recurs. T lymphocytes help to protect against virus infections and cancer and are divided into helper cells, suppressor cells, cytotoxic cells, memory cells and mediators of delayed hypersensitivity. There are also large granular lymphocytes. These are the KILLER CELLS (K cells) and the natural killer cells (NK cells). 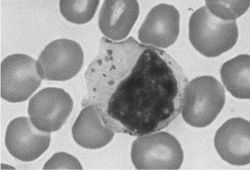 Small white blood cells that bear the major responsibility for carrying out the activities of the immune system; they number about 1 trillion. n.pl white blood cells of the agranulocyte type, originally from stem cells, that produce antibodies and attack harmful cells. There are two categories of lymphocytes: B cells and T cells. In the early 1980s, Yamaguchi and Schoefl documented that circulating lymphocytes are able to selectively recognize and adhere to the lumen of HEVs and that this mechanism is influenced by the circulating lymphocyte level. The overweight group showed a higher lymphocyte count, thereby confirming the positive correlation of lymphocyte count with BMI. Changes in count and function of splenic lymphocytes from patients with portal hypertension. Neutrophil and lymphocyte counts as clinical markers for stratifying low-risk prostate cancer. The secreting granules were isolated from lymphocytes by the method proposed by Podack et al. T lymphocytes H3 acetylation was related to HbA1c (P < 0. Use of the neutrophil: lymphocyte ratio in the diagnosis of appendicitis. All cases were found to have CD4+T lymphocytes cell count below 400 and 9(9%) of k the cases had even less than 200. The 'mother' lymphocyte seems to divide into two daughter cells that are already different from birth," said Chang, "with one becoming an effector cell while its sister becomes a memory cell. And they don't have much effect on frog lymphocytes, the researchers found. Through this method, the haemo- lymphocytes nucleus also could be separated into three size groups: large, medium, and small, with diameter ranges of 8.